Now that baseball season is over……WHY ARE YOU BUNTING YOUR NUMBER THREE HITTER IN THE FIRST INNING?!?! MOTHERFRIGBOTJAIDOAKEAMFAEIOPDAOJRFIAONGUEAPUEPAS!!!! Sorry, NOWWWWW that baseball season is over, we move on to a dead fifty or so days to speculate about our team/depth chart/schedule/the first offensive play we run against UNC/whether we should incorporate garnet helmets/pics of Spurrier with his shirt off/etc. Then in August players will report and in the five minutes before practice closes we’ll get to see who looks awesome in pass skels/who really worked hard over the summer/whose punts are going higher/where is D.L. Moore? Until those glorious days we have to kill time with something, so the word “kill” makes us think…how about a blog post about Jadeveon Clowney? Haven’t seen a new one of those recently. And by recently I mean Guy Pearce in Memento recently. As in the last ten minutes. @RubrChickens @UMGoBlog He crushed a back solely because he was accidentally left unblocked. Congratulations. @RubrChickens @UMGoBlog And that back is literally one of the smallest players in the BCS. You get no points. These tweets are laden with understandable bitterness. I mean, they watched their little guy get destroyed day after day after day on ESPN in what will be a strong contender for play of the decade in college football. How could you not get sick of your guy getting humiliated at least twice a day for months? 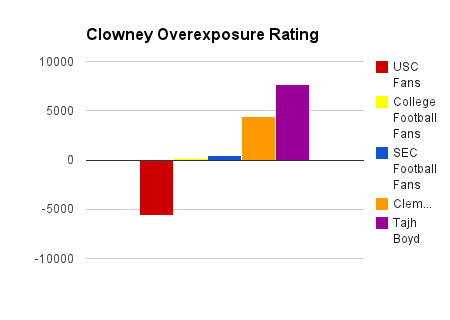 That made me think – are people really getting sick of the magnificent (h/t Andy Demetra) Jadeveon Clowney? Is he overexposed? Obviously South Carolina fans can’t get enough of Clowney. They show up well below the overexposure line, and will probably never come close to it no matter how many helmets he separates from heads. In yellow is college football fans in general. This number would probably be below the Clowneyline if not for Michigan fans. I think college football fans across America love J.D. and his exploits for the most part. But the Michigan fans’ utter hatred for “The Hit” pushes the entire group into overexposure territory. The Clemson bar passed “0” in the fourth quarter of the 2011 game, and the plus number quadrupled as the 2012 game came to a close. The final bar – Tajh Boyd. Tajh has consistent nightmares about the garnet 7 chasing him on the field, through the tunnel, up Assembly Street, and clear past the sundae bar at Golden Corral. It’s horrific, thus his ultra-high overexposure number. The thing is, for Carolina fans, we should really enjoy the next few months of hype for perhaps the greatest athlete we’ve ever seen on our campus. For everyone else, you should probably enjoy this time prior to the season actually starting. Because once it starts, it means he’s going to be lining across from your guy. And it ain’t gonna be pretty.